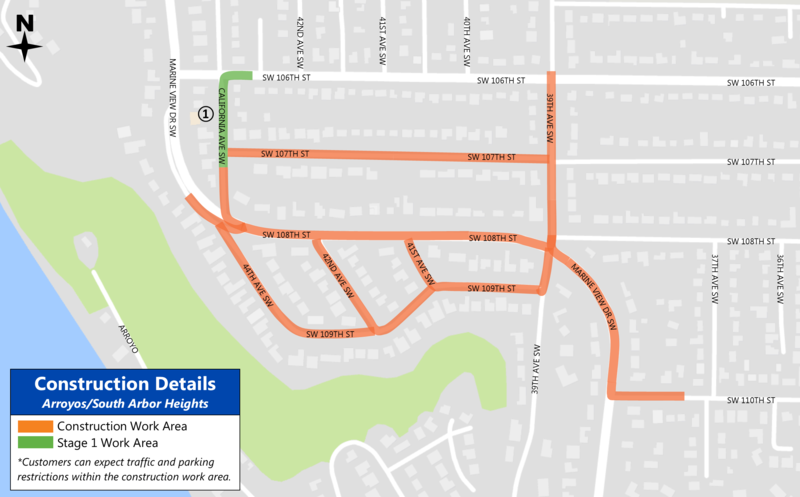 Starting in May 2018, Seattle City Light will be working in the Arroyo/South Arbor Heights area to install new electrical conduits, vaults and streetlights. This work is needed to replace aging underground, direct buried cables in the neighborhood. Construction will start at California Avenue SW, between SW 106th and 107th streets. To follow the progress of this work, please visit our website. City Light crews will be working in multiple locations at a time. 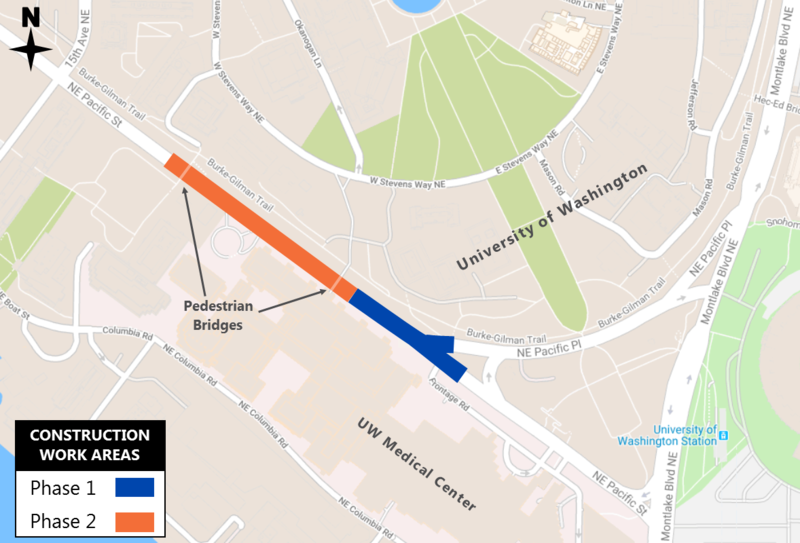 Construction will start at California Avenue SW, between SW 106th and 107th streets. Customers can expect temporary parking and traffic restrictions. Crews will work to limit traffic impacts. Example of crews trenching for new conduit. Trenching for conduits will occur in the public right-of-way (e.g. street and planting strips). Some sidewalk and driveway aprons will be affected. Trenches will be covered with steel plates or fenced off outside of construction work hours. Maintenance power outages are required to do the work safely. Affected residents will be notified in advance before any outage. Civil and electrical construction is estimated to last approximately 18-20 months. Additional streetlight work will follow. Daily work hours are from Mondays through Fridays, 9 a.m. to 3 p.m., and weekends from 9 a.m. to 6 p.m. Construction could extend beyond these hours, as needed. Customers can contact David Mannery, Senior Electrical Service Representative at (206) 386-4245 or david.mannery@seattle.gov. Visit Seattle City Light’s “At Work in Your Neighborhood” website for the latest updates on this project: www.seattle.gov/light/atwork/release.asp?RN=402. In March 2018, Seattle City Light crews completed a civil construction project in South Lake Union. Crews installed electrical vaults and duct banks on Harrison Street, between Dexter and 9th avenues north. Crews completed the final stage of construction at the intersection of 9th Avenue North and Harrison Street. Councilmember Teresa Mosqueda and City Light's Transmission & Distribution Operations Officer, Bernie Ziemianek toured the Harrison Street project in January 2018. Completed pavement area on Harrison Street. Crews installed electrical conduit and vaults along Harrison Street. Completion of this work will result in increased electrical reliability for the South Lake Union neighborhood. City Light thanks its customers for their patience during the duration of this project. Learn more about this project and others by visiting Seattle City Light’s “At Work in Your Neighborhood” website. Starting as early as Thursday, August 3, Seattle City Light crews will begin a project to maintain the electrical reliability in Pioneer Square. Crews will excavate and replace underground electrical conduits (duct banks) and then pull in new electrical cable at vaults near South Jackson Street and First Avenue South. 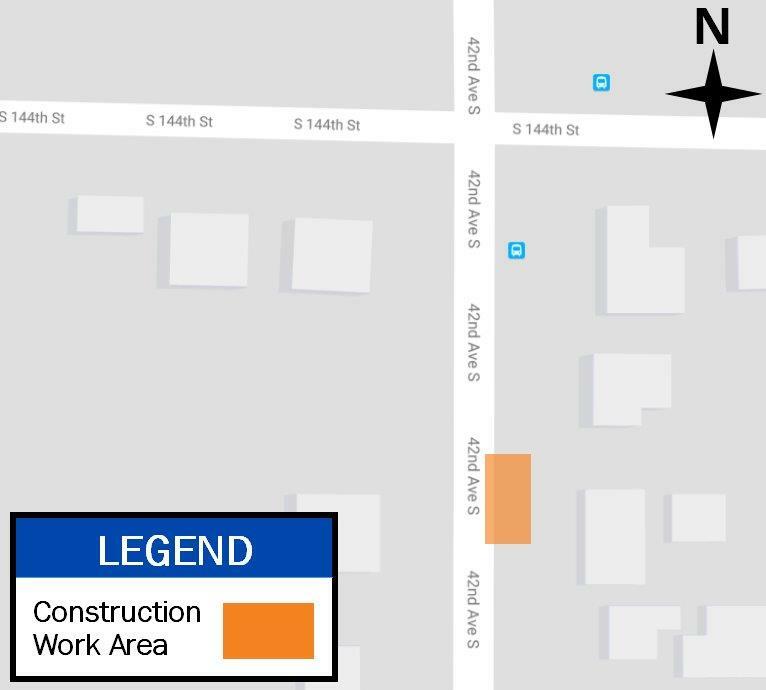 The work will start approximately one-half block east of First Avenue South and end at South Jackson Street’s intersection with it. The work is being done in coordination with the Center City Connector Streetcar project and will occur in three stages (see map below for details). Map of project during Stage 1. It will last approximately 45 days and start as early as August 3. Map of project during Stage 2. It will last approximately 30 days and is planned to start September 2017. Map of project during Stage 3. It will last approximately 30 days and is planned to start October 2017. There are no power outages expected during the course of this project. Traffic, parking, and pedestrian impacts will occur near the work site to promote safety and accommodate equipment. Heavy equipment and trucks will be located at the work site. Uniformed police officers will assist traffic and pedestrians, and excavated areas will be covered with steel plates during non-work hours. The project’s planned start date is as early as August 3. During Stage 1, crews will work Monday to Friday from 9 a.m. to 3 p.m.
During Stages 2 and 3, planned for September and October respectively, crews will be working Saturday and Sunday from 9 a.m. to 6 p.m. 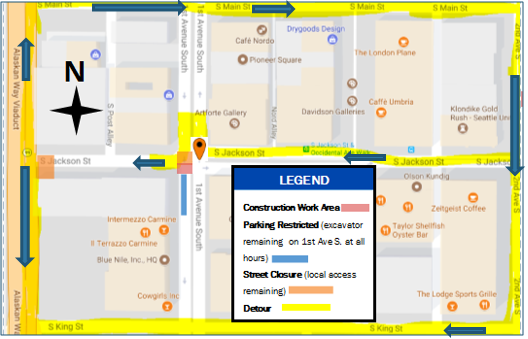 Starting as early as August 1, 2017, Seattle City Light crews will begin a project to maintain the electrical reliability in the Pioneer Square area by connecting and repairing underground conduits. The work will start on South Washington Street west of the alley between First Avenue South and Alaskan Way South (Stage 1). At Stage 2, the work will occur in the intersection of South Washington Street and Alaskan Way South. This work will reduce the likelihood of unplanned power outages. Map of construction work during Stage 2 of the project. Only one half of the intersection will be worked on at a time. During stage one, there will be local access only onto South Washington Street and only from 1st Avenue South. 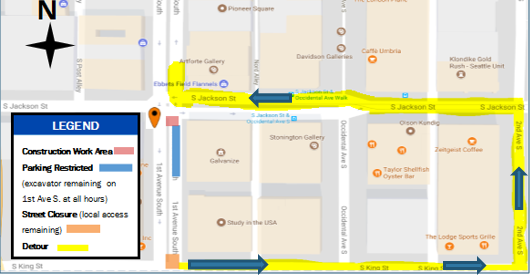 During stage two, traffic will be reduced to one lane in both directions on Alaskan Way South and west bound only on South Washington Street. Bike lanes will be closed when crews are working on the east side of the intersection. Bicyclists will need to merge with traffic in the work zone. In both stage one and two, in order to promote safety and accommodate equipment, parking will be closed from 9 a.m. to 3 p.m. week days and 9 a.m. to 6 p.m. weekends (intermittent). Two or more spaces will be taken overnight on South Washington Street to stage equipment. Uniformed police officers will be on site during both stages and at all times to assist with local traffic, load/unload issues, and pedestrian access. The project’s planned start date is as early as August 1, 2017, and is estimated to last until fall of 2017. Daily work hours are Monday to Friday, 9 a.m. to 3 p.m., and intermittent weekend work from 9 a.m. to 6 p.m.
Visit Seattle City Light’s construction website for the latest updates on this project: South Washington Street Infrastructure Improvement or contact Michael Danielsen, Project Manager at 206-684-3907 or michael.danielsen@seattle.gov. Seattle City Light recently completed the final stages of work for the East Union Street Underground Conversion Project. City Light’s contractor, Pellco Construction, installed underground electrical conduit, vaults and associated equipment in parts of East Union Street, from 10th to 11th Avenue. Contracted crews excavated on the corner of 10th Avenue and East Union Street. Crews trenched across East Union Street near 10th Avenue. Crews trenched across East Union Street near 11th Avenue. Crews work to restore a portion of sidewalk pavement at 11th Avenue near East Pike Street. Crews restored the sidewalk area on 11th Avenue and East Pike Street. The temporary fencing is scheduled for removal during the week of July 17. Restored sidewalk area at 10th Avenue and East Union Street. Restored sidewalk area on 11th Avenue near East Union Street. Restored curb area on East Union Street, between 11th and 12th avenues. This work was aligned with the City of Seattle’s ordinance to underground power lines in the Capitol Hill neighborhood. Construction also included improved sidewalks and ADA curb ramps along East Union Street, 10th and 11th Avenue. The completion of this seven-month project allows for a more reliable power system in the Capitol Hill neighborhood. The new electrical infrastructure will improve electrical reliability as well. Seattle City Light appreciates the patience of its customers during the construction for this project. For more information about this project and others in your neighborhood, please visit Seattle City Light’s “At Work in Your Neighborhood” website. Search for utility construction projects in your area by neighborhood, address and ZIP code. This past June, Seattle City Light recently completed the final stages of civil construction at 6th Avenue and Cherry Street. Crews excavated for new conduit (duct bank) between the existing electrical vaults on the west side of 6th Avenue and the south side of Cherry Street. Seattle City Light stage equipment and steel plates along the west side of 6th Avenue. Crews place steel plates over the trenched areas along 6th Avenue. Steel plates cover a section of the excavated area on Cherry Street. Image of the restored street at the intersection of Columbia Street and 6th Avenue. The completion of this 10-month project will allow Seattle City Light to provide new electrical connections to the downtown and First Hill areas. The construction will improve electrical reliability as well. City Light appreciates the patience of its customers during the construction for this project.